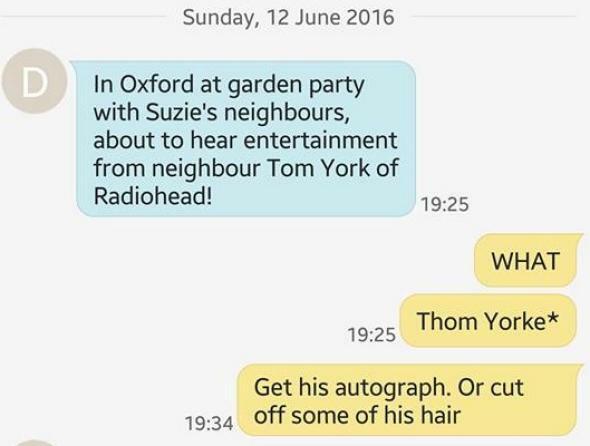 Radiohead’s Thom Yorke played an acoustic set at an Oxford, England garden party (VIDEO). We’ve all been there—you’re out at a backyard barbecue or a friendly little get-together, just hanging out, when Thom Yorke breaks out a guitar to liven things up. At least, that’s apparently what happened Sunday afternoon at an Oxford, England, garden party. Local native Yorke, on temporary break from Radiohead’s 2016 tour schedule, popped up under a neighbor’s gazebo for a short acoustic set—reported to have included the songs “Reckoner” (part of which you can watch above), “Desert Island Disk,” “No Surprises,” “Street Spirit (Fade Out),” and “I Might Be Wrong”—at a gathering in honor of the Queen’s 90th birthday. No word on whether the crowd broke for a tea-and-biscuit intermission, but they certainly seemed to enjoy the show.